In the year 1998 passed the HSC examination under the ISC Board, securing 70%. A first class graduate in economics (with statistics and computers as subsidiary subjects) from L D Arts College, Gujarat University. Gold Medalist (74 per cent) in Masters in Development Communication from Gujarat University. Passed UGC-NET examination for Assistant Professor in 2017. PhD from CEPT University, Ahmedabad. Teaching communication skills to First Year students of Electrical, Mechanical and Industrial Training Engineering students. Developing strategies to interact with media on developmental issues related to rural areas and impact on rural livelihoods. Lead the tribal radio team and manage the programme. Interaction with the staff and executives involved in programmes and translate the learning into literature for external sharing. Interaction with the Pan Village institution and develop communication strategy for the institutions for external world. Develop communication strategy for the organisation. Explore corporate partnerships for the organization. Organising state-level and international level seminars. Was responsible for the group’s exhibits in Samvaad: A dialogue for sustainable Rural Development on December 16-17, 2004 and Education for a Sustainable Future (ESF) on January 18-20, 2005. Handled the media coverage for the International Conference on Education for a Sustainable Future (ESF). Identifying potential authors for the Environment and Development Book Series. Editing and rewriting news reports for both regional and national desks. Designing page layouts and page making. My job also involved news and feature reporting. Developed copies and concepts for creative execution. Writing and editing content for clients’ like-Havmor Ice-cream, Top’n Town Ice-cream, Neptune, Swedeshi Chairs etc. their Corporate Social Responsibility (CSR) projects. Have represented ABB in their activities at two primary schools and co-ordinated with the education department officials. Helped set up a technology hall at the Vadodara Community Science Centre. Training on Promotion of Rational Use of Medicines in the Community at the Government Medical College, Nagpur. Training on Knowledge Practice Coverage Survey (KPC) by Dr. Kshitij Sharma, M&E Manager, Counterpart International. Training on Behavior Change Communication and Counseling by Ms. Darshana Vyas, Director, Health Programs, Counterpart International. Certificate course on Resource Mobilisation and Communication for NGOs organized by Resource Alliance and ICFAI Bussiness School. “Giving for a Cause: Understanding Hinduism and its philosophy of Giving” in Mass Communicator, ISSN No- 0973-9688, Mass Communicator: International Journal of Communication Studies (In process). “The Green Revolution: Social Change through Social Media” in International Journal of Social Sciences and Management, ISSN No- 2091 2986, Volume 3, Issue 3 in July, 2016. “Promoting Organizational Brands as Desirable Employers through Company Websites: A Study of Three Indian Companies” in IUP Journal of Brand Management, ISSN No- 0972 9097 in June, 2016. “Net Neutrality: Social change through Social Media” in Asian Journal of Management Research, ISSN no – 2229 3765, Volume 6, Issue 3. “Role of media in decision-making: What helps students join a business school” in International Journal of Advanced Educational Research, 1(3), May 2016, ISSN No – 2455-615. “Opinions on Social Media: The New Age Challenge for individuals and Organizations” at the 5th Annual Conference on Indian Insights: Integrating Individuals, Institutions and Innovation organized by Indian Institute of Management, Indore on 18-20 December, 2017, Indore (in absentia). Presented a paper on “Net Neutrality: Influencing Policy through Social Media” at the Second International Conference on Contemporary Debates in Public Policy and Management” organized by Indian Institute of Management, Calcutta on 15-17th January, 2016, Calcutta. Presented a paper on “Emergence of Activist on Social Media to Influence Public Policy” at the Second International Conference on Contemporary Debates in Public Policy and Management” organized by Indian Institute of Management, Calcutta on 15-17th January, 2016, Calcutta. Presented a part on “Green Revolution: Social Change through Social Media” at the 4th Annual International Conference on Sustainability: People, Policy and Practices, 11-13th March, 2015, Rajiv Gandhi Indian Institute of Management, Shillong. Was a panelist in a panel discussion on “Communication for Social Impact” at MICA, Ahmedabad on 26th August, 2015. Attended a Faculty Development Programme on “Fundamentals on Research Methodology” at Shanti Business School, 13-19th July, 2015. 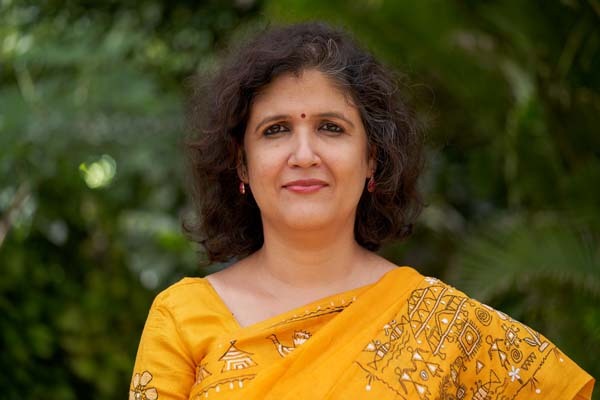 Dhriti Bhattacharjee is an Assistant Professor of Communication at Shanti Business School, Ahmedabad. She has done her masters in development communication from Gujarat University. She has nine years of industry experience and three years of academic experience. She has worked with an English newspaper and development organizations of national and international repute. She is currently pursuing her PhD in communication.